The last baseball book I read before this one was “The Last Boy: Mickey Mantle and the End of America’s Childhood”, which recounted the misbehavior and redemption of Yankee great, Mickey Mantle. It was scary. “Playing with Purpose: Mariano Rivera: The Closer Who Got Saved” tells a very different story about another Yankee great–the greatest closer in baseball history, Mariano Rivera. I admit, I’m not the biggest Yankees fan in the world, but I’ve always admired their “Core Four”: Derek Jeter, Andy Pettite, Jorge Posada, and Mariano Rivera. Despite all the chaos that follows the Yankees, these four showed competitiveness, teamwork, and class. I’ve especially liked Mariano Rivera. No matter the situation, he walked to the mound as if in a bubble of calm. Then he mowed down hitters without seeming to break a sweat. Even more impressive, I remember watching an interview with Rivera after he’d suffered an incredibly rare blown save. He said he was disappointed for his team, but it was a baseball game, and he was grateful that God allowed him to do this for a living, and that his family was healthy. Mariano Rivera actually does have his priorities that straight. “Playing with Purpose: Mariano Rivera: The Closer Who Got Saved” is, as you might guess from the title, the story of Rivera’s baseball career, as well as his journey in Christian faith. From his humble boyhood in a poor, Panamanian fishing village, through tough times in the minors, to the pinnacle of his profession, Mariano Rivera has always been a class act. He doesn’t drink, and has never done drugs. He married his high school sweetheart, and is an attentive father to his children. Beyond that, he has donated millions of dollars, taken the time to share his faith at hundreds of churches, and donated countless hours helping out those less fortunate than he is. This book reminds me of baseball biographies I read when I was a kid. We get a precis of Rivera’s career and triumphs. It doesn’t recount every save he’s ever recorded, nor does it need to. We get a healthy dose of Rivera’s pitching mastery, and his strong sense of teamwork. In addition, we learn a little about his boyhood and how it led him to baseball, and his humanitarian work. 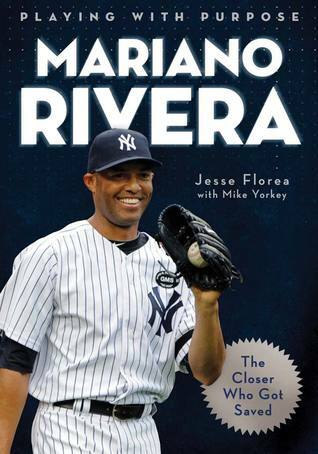 This book also explores Mariano Rivera’s Christian faith. Faith and family are the twin cornerstones of Rivera’s life, with baseball coming in third. It would be impossible to write Mariano Rivera’s biography, and not explore his faith. This book is part of the “Playing with Purpose” series, which explores different athletes and how their faith works for them in their professional and off-field lives. It is as much a story of faith in action as it is of baseball greatness. As such, there are small sections scattered throughout that relate a Bible verse, or give an aside to a faith-specific part of Rivera’s life. The end result is an accessible, well-written biography of one of baseball’s true class-acts. That it’s also the story of one man’s relationship with God is obvious from the cover. Either way, it’s a book I’d have devoured when I was a kid, alongside bios of Jackie Robinson, Sandy Koufax, Babe Ruth, and Roberto Clemente. Whether or not you’re raising your kid in the church, “Playing with Purpose: Mariano Rivera: The Closer Who Got Saved” provides a reading experience all-too-rare in today’s world: the true story of a baseball superstar, who is also a legitimate good example for young people. This entry was posted in Books, Children, Memoir or Biography, Religion/Spirituality, series, Young Adult and tagged booksandmoviesandcrap.com, Playing with Purpose. Bookmark the permalink.